Chapter 66, Wisconsin Statutes, establishes the state’s general municipal law. Among other regulatory authorities, local units of government, town chairs, village presidents, and city mayors and managers can annually require the destruction of all noxious weeds within their respective municipalities. The statute defines “noxious weed” as “Canada thistle, leafy spurge, field bindweed, any weed designated as a noxious weed by the department of natural resources by rule, and any other weed the governing body of any municipality or the county board of any county by ordinance or resolution declares to be noxious within its respective boundaries” (s. 66.0407(1)(b), Wis. Stats.). The law requires that landowners destroy all noxious weeds on lands they own or control. On this page, we have provided some example ordinances adopted by Wisconsin municipalities. 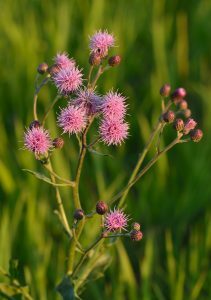 The Wisconsin Invasive Species Council recommends that local noxious weed ordinances be used to facilitate implementation of ch. NR 40, Wis. Adm. Code and that when designating noxious weeds emphasis be placed on regulated invasive species as listed in ch. NR 40. Chapters 59, 60, and 61, Wis. Stats., authorize expenditures for control of invasive species, weeds, and pests. Wisconsin Statutes also permit municipalities to impose special charges against property for current public services provided to the property including noxious weed cutting/removal. The League of Wisconsin Municipalities has prepared a manual that outlines the procedures prescribed by Wisconsin law for levying special assessments. A template for local noxious weed ordinances is available on the Legislature’s website. Disclaimers: The codes and ordinances provided above are offered as examples only and may not be the most recent version of the adopted laws. Municipalities may have more current or accurate information. We make no warranties or guarantees about the accuracy, completeness, or adequacy of the information provided or the information linked to on the Council site. Please check official sources. Section 1.01, Wis. Stats. establishes the State of Wisconsin as a sovereign entity. As a result, state agencies are not bound by municipal ordinances. This includes noxious weed ordinance adopted by a municipality. If a municipality would like to manage state-maintained roadsides in accordance with its own ordinances, the municipality may request a written permit from the Wisconsin Department of Transportation to be allowed to perform the work. The department will not pay a municipality for work completed either with or without the benefit of a permit.